I have not posted anything in over a week, so to avoid falling back any further here is a historically ordered summary of the progress since the last post. First and foremost we have the weaggles now – small purple creatures that pilot the tanks and love destroying things. A name born by to unmatched creativity or simply lack of imagination (…cuz they have no arms, they can only wiggle). The next modification was rather minor, but made a huge impact. 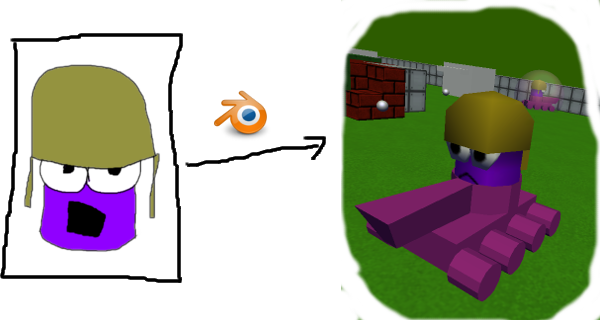 Making the light brighter changed the gloomy look of the game into a full of color bright and happy toon (which is what we want :)). 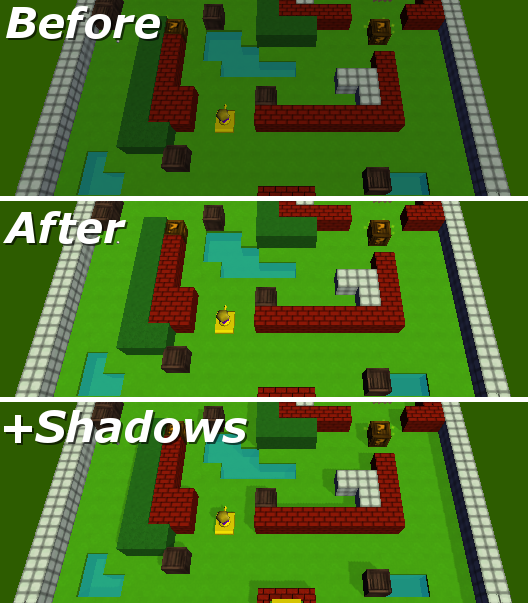 Dynamic shadows contribute even further, however they come with a big performance hit (my rendering isn’t exceptionally optimal). One thing that’s worth mentioning is the color ramp. 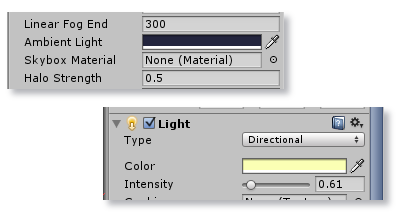 There is a rule in art/color theory that states shadows are blue… so our ambient light is not the default unity gray, but rather dark blue. Likewise our sun (directional light) is not white, but soft yellow. Kudos to Yani Genev for helping out on this. 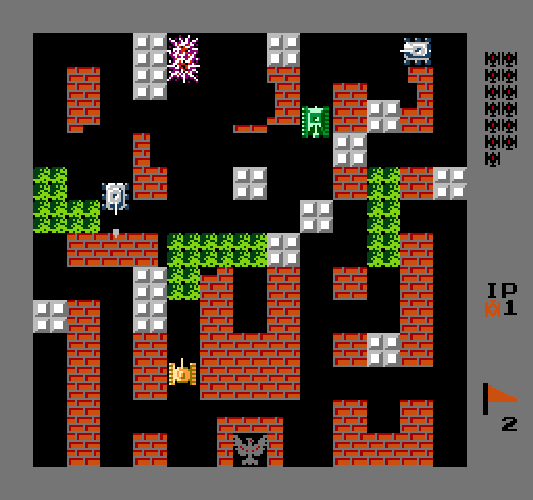 The original spawn mechanic was based on an abstract resource that was hidden somewhere, the player had 3 resource points (which are equivalent to 3 lives) and the enemy tanks had 20. If you broke the enemy bases, before the spawn resources were depleted you would be able to achieve victory (which was my way of making the bases an alternative target). The system worked, but it wasn’t as elegant as the one Yani suggested i.e. 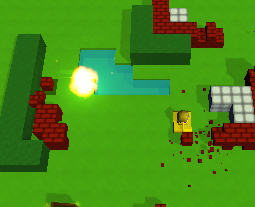 removing the abstract resource and making spawners pay with their hit points. The reason the new system is better is simple – there are less numbers for the players to keep track of. 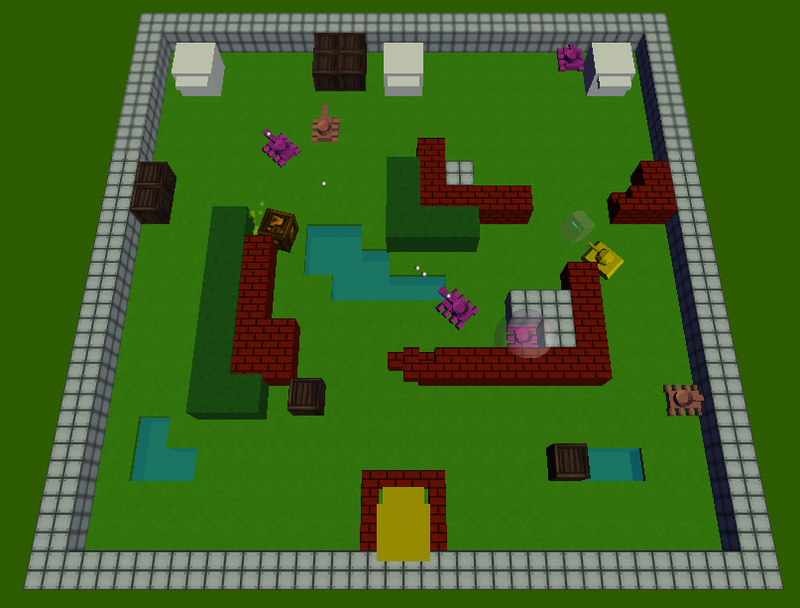 But there is more, destroying an enemy base or even just damaging it, has a more direct impact on the game (the more damage the less tanks). On the other hand having your base shot at isn’t as punishing – it used to take only 1 hit (and you lose all of your lives), now it drains your lives gradually. Here’s a quick status update. 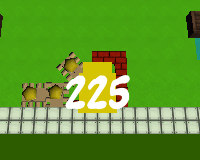 My quick and dirty physics implementation has been replaced by the Unity Physics Engine. Everything is now physical; tanks can push other tanks or crates, climb up slopes and fall down in holes. On top of that movement is still grid based (which was actually the hard part). End of the week report. Alright, it’s Sunday, so lets wrap things up. Then I decided to add some texture, because plain colors were starting to look boring. I also meddled with Unity animations and finally got the hang of them (I think). Minor game-play tweaks, minor setting adjustments here and there, but nothing really significant on the functional side. Well technically 3 and a half. I started this project on Sunday (15th of September). Lest see if we can finish it in one month :) I’ve been wanting to learn Unity for quite a while now, especially because every client seems to demand it nowadays (so many people develop games for the Android). Usually I would go around and try to get inspiration from a number of games, movies, books or plain concepts, then try to blend them and try to get something original. This time around though I decided simply to make a clone of an old Nintendo classic (clones are something I generally despise). No, it’s not Mario. One of the greatest things about NES games is that they are inherently simple (due to hardware limitations), a tiny set of rules with small number of objects and simple interactions between them. With such constraints it is hard to make something monstrous which goes out of control and never sees the light of day. Lets see if we can pull this off with Unity. Up until now I had only launched Unity a couple of times, just to test the waters, but never done anything serious with it. Mind you, I have been crating games since I was 15, every experienced software developer would say, once you’ve learned a couple of languages it no longer matters what you write code in, C# is no exception (it’s essentially “C++ meets Java”). The user interface and Unity’s API and features was something I had to get more familiar with, so half of the time I spent in tutorials. 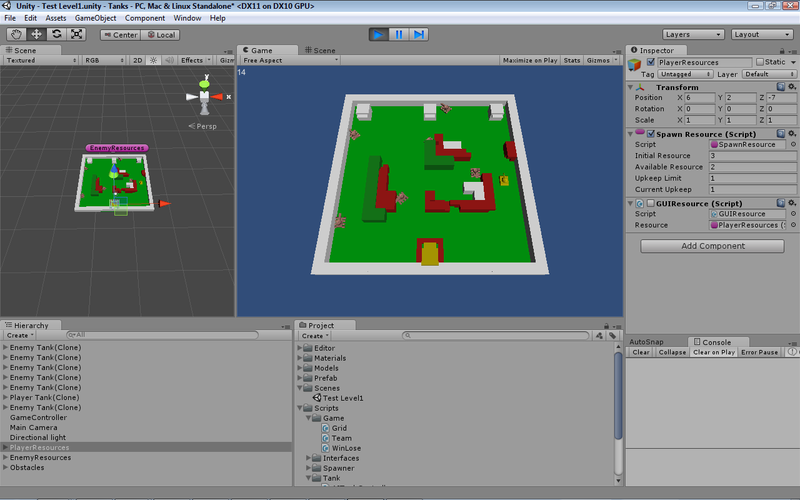 My impression of Unity is that it’s one of the most powerful RAD tools for game development. Seriously, for a person who’s never used a professional editor with a powerful engine it’s just mind-blowing, and that wasn’t one of the things they thought at my uni. What used to baffle me about it was the component based architecture, normally I would wrinkle and try to figure out how to make best use of a tool, so that my code can be reused later on (I tend to over-think software design and obsess with quality), this time I decided to just go with it and optimize, redesign and generalize later. After all the generally accepted right way to get things done is the lazy way – YAGNI and “don’t fix it if it ain’t broken”. Besides this I have a growing number of features I want to add, but I’m cautious not to start on them too early. There are no power-ups yet and I may or may not add them in the first version. How to finish your game? Historically my individual projects have suffered from a syndrome called “feature creeps”, they always start small but grow exponentially in complexity until the point they are impossible to complete. Other times immense amount of time gets spent on features which turn out to be unimportant. Either way the finish line remains out of sight and the passion that started the project eventually burns out. A healthy response to a problem is to acknowledge that you are not the first person to have experienced it. Others have probably found the solution, in which case Google becomes your best friend. This morning was a morning well spent, despite being constantly distracted I managed to roll up my sleeves and do a lua function parser for Notepad++ (rather than wasting my time with actual work). In the process I learned that a) Notepad++ function list doesn’t support lua by default, you have to add them manually, b) the function list looks very pretty and allows not only function but class definitions as well c) regex have lookaheads, lookbacks and K.
I used this StackOverflow question as a starting point, but noticed that the solution that best matched my situation ignores table functions. This was unacceptable because most of my code tends to be structured in classes. After fiddling around with it I got it just about right. The next snipped is added to <parsers>. This will group together functions defined as <class>.<function> and <class>:<function> (or <class>.<class>./:<function>) and place them in their appropriate classes in the Function List viewer. It will also capture lose global or local functions and display them as normal. It will unfortunately accept illegal constructs and definitions, but you get compile errors for those.